The Virgin Martyr Julia was born in Carthage into a Christian family. While still a girl she was captured by the Persians. They carried her off to Syria and sold her into slavery. Fulfilling the Christian commandments, Saint Julia faithfully served her master. She preserved herself in purity, kept the fasts and prayed much to God. No amount of urging by her pagan master could turn her to idolatry. Once the master set off with merchandise for Gaul and took Saint Julia with him. Along the way the ship stopped over at the island of Corsica, and the master decided to take part in a pagan festival, but Julia remained on the ship. The Corsicans plied the merchant and his companions with wine, and when they had fallen into a drunken sleep, they took Julia from the ship. Saint Julia was not afraid to acknowledge that she was a Christian, and the savage pagans crucified her. An angel of the Lord reported the death of the holy martyr to the monks of a monastery, located on a nearby island. The monks took the body of the saint and buried it in a church in their monastery. 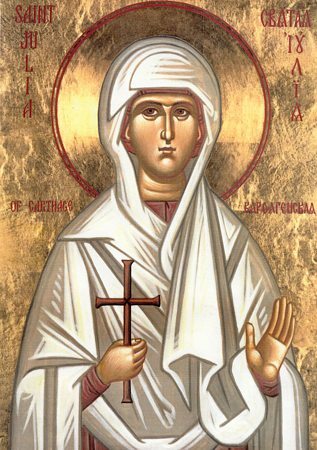 In about the year 763 the relics of the holy Martyr Julia were transferred to a women’s monastery in the city of Breschia (historians give conflicting years of the death of the saint: as either the fifth or seventh century).